This is a simple stand alone task-list whose sole responsibility is to assign tasks to groups of Case Handlers (CH) that do manual tasks in the enterprise wide domain. The task-list has no knowledge of the overall process. The tasks the task-list receive contain enough information to explain what the task is, and to redirect the CH to the right GUI for doing his task. The tasks are defined and maintained in the Module that has a need for manual work, but dispatched to this common task list. These tasks are tasks that are well defined in a work-flow. When a task is done, or no longer relevant (the Modules that owns the task decide), then the task is removed from the task list. When we first have the events in the event log, automating the next step is quite easy and can be done in a lightweight manner. A simple Message Driven Bean may forward the message in a event driven manner via some JMS-queue, or a large legacy system may query for a file once a week because that is the best operational situation for it (operational flexibility is also discussed in CDH). Also events may be logged that only come in operational use a year later, making maintenance flexible, and history robust. This is discussed in this article about a generic Case Container representing all Cases handled in our domain. Its purpose to to contain the Case with all its metadata, the process state and references to all incoming and outgoing xml-documents. This is usually called Case Handling and consists of a case which is outside the existing Modules or systems, and that need the completion of many formal sub-processes, but at startup of the process it is not possible to foresee how the case will be solved. 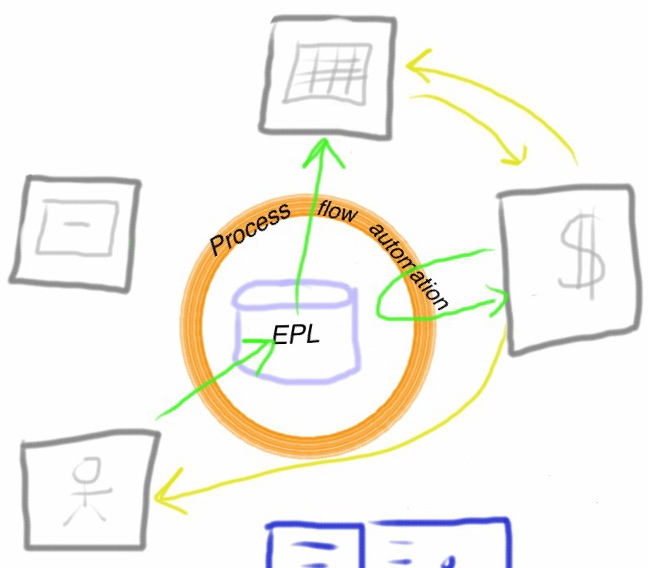 This is typically where know business process ends, and a more ad-hoc process is applicable. Also this system support the collection of different types of information relevant for such case-to-case systems. This information may very well be external information collected in a manual matter. Above is the logical design, and this is what we think we need. You might say it follows a hub-spoke design, where the Modules are the spokes and these 4 elements comprise the hub. These are all 4 discrete components that interact in a services oriented manner, with each other and with other Modules or systems. The main idea is that this will enhance maintenance and reduce the need for customizing COTS. Illustration 1. Just to show a fire-and-forget situation (green) where the Tax Calculation and Collection are interested in House events. Tax Calculation wants them live, and the processing forwards the event, while Collection every 2 months, via file, and then issues service requests (yellow) to Party to get details. The EPL event holds a reference to the Case Container. The notified Module then uses the Case Container to open all relevant information for this Case and the process state the Case is in. Illustration 2. 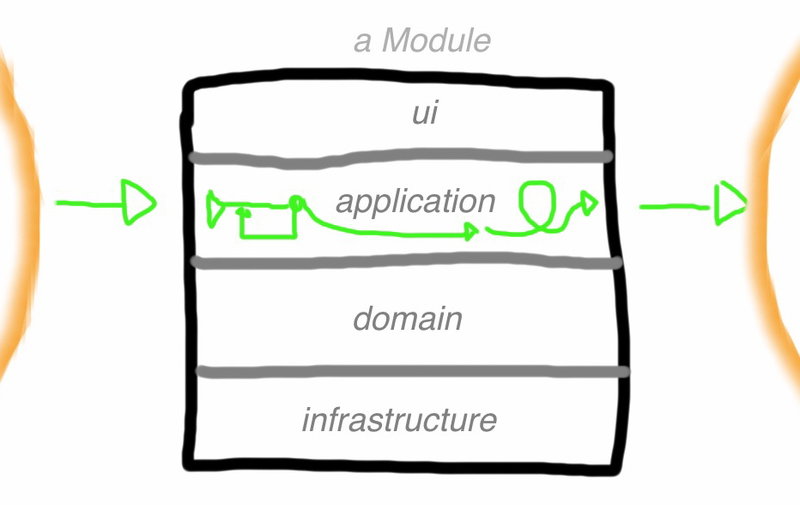 Show a Module of DDD where the application layer interacts with the enterprise wide process handling. 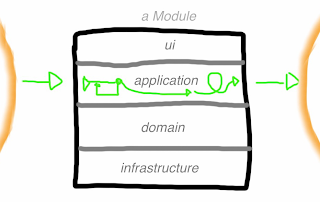 The green line show how the Case Container is shipped to the Module where its reference are opened by the Application layer and sent to the Domain layer for handling. The Case container is really the container that it is in the logistics world; bringing a complete set of good from one place to another. We are implementing this with REST and XML, where feeds play an important part in transporting events and data. URI represent addresses for Modules, and are linked to specific Case Container Types. We do not mandate the usage of the Task-list. If there is some need for task-list internal to a Module that is more efficient for the users that handles tasks solely in a Module, it is OK when it gives a better maintenance in the long run. Also we do not mandate what technology that does different work in the Process flow automation, it may be Message Driven Beans forwarding to some queue, Mule, Camel, BPEL for some orchestrated process, or simple Query to file. Of course you still have to have a good design and understanding of the business processes. And it must be there to communicate between business and IT (BPMN is great for this). But as in other areas of systems development: Design is to communicate between people, and implementations is to communicate to machines. Therefore a combined design-implementation (eg. BPEL) will have a hard time achieving both. The business process is not fragmented, but I argue that the implementation of the business process is best handled in the above-mentioned manner; The process will sometimes occur within a Module (system), and sometimes in-between. 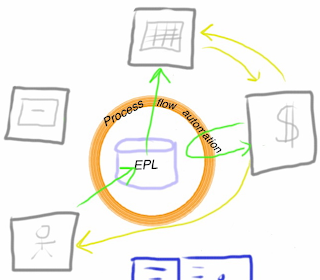 Enterprise wide business process handling by Tormod Varhaugvik is licensed under a Creative Commons Attribution-ShareAlike 4.0 International License.